For several years I have been concerned about the loss of length of my stride that had become increasing marked since my early sixties. At peak sprinting speed, my step length is less than 1 metre. To achieve even a modest pace of 5 min/Km, I am forced to increase cadence to over 200 steps/min. At paces in the vicinity of 5 min/Km, efficiency tends to increase as cadence increases from 180 to 200 steps per minute because the energy consumed in getting airborne and overcoming braking decreases as cadence increases up to 200 steps /min (as demonstrated my post of 6th Feb 2012). However, the energy cost of repositioning the legs during the swing phase increases with increasing cadence, as discussed in my post of 27th Feb 2012, and in my calculations performed on 5th April 2012. Therefore, at paces in the range 4 to 5 min/Km, efficiency falls as cadence increases substantially above 200 steps per min. Initially I considered that loss of leg muscle strength was the cause of my short stride. So a year ago I embarked on a program of weight training, mainly employing squats and deadlifts. I was delighted that I was able to recover my lost strength, but unfortunately, it made little difference to my stride length. I had intended to follow the initial weight sessions with some plyometrics, in the expectation that plyometrics would help me harness the increased strength and allow me to capture more elastic energy to drive powerfully off stance, but a minor relapse of arthritis confounded my plan. By the time the arthritis had settled it was time to direct my energy towards re-building aerobic fitness for the Robin Hood half marathon in September. I increased weekly training volume fairly rapidly but only managed a rather mediocre half marathon. After recovering from the half-marathon, it was time re-consider my former plan to introduce plyometrics. However, I was a little alarmed by continuous aching in my legs, especially at the attachment of peroneus longus to the upper part of the fibula in both legs. In addition there was a generalised aching of the connective tissues around and below both knees. This had built up gradually during the summer and did not resolve even after I cut back the amount of training quite drastically. By late October I was reluctant to put off the plyometrics any longer, though it was clear that I would need to be fairly cautious. What intensity of plyometrics is required? What evidence is there that a modest program of plyometrics would lead to a worthwhile gain in running efficiency? A study by Turner and colleagues had assessed the change in running efficiency produced by 6 weeks of fairly gentle plyometrics in a group of moderately trained, young adult runners. The program involved adding three plyometric session per week to the runners’ usual training. Each plyometric session involved six exercises starting with sub-maximal double-leg vertical jumps at 50% effort as a warm-up, and then proceeding to various forms of double-leg and single-leg jumps. For example, one of the exercises was submaximal double-leg repetitive vertical jumps of 6–8 in., using minimal knee and hip action while emphasizing the calf action. In the first week, each session included 60 foot-contacts, increasing to 140 foot-contacts per session by six weeks. The outcome was a significant increases in running efficiency of 2-3% at paces in the range 5 – 6 min/Km. A control group who continued with training as usual showed no increase in running efficiency. Neither group exhibited increase in VO2max, or a significant increase in counter-move jump (CMJ) height. The lack of significant increase in CMJ height was perhaps surprising, though in fact the group undergoing the plyometrics did exhibit a mean increase from 36 to 38 cm. This was not statistically significant, but the study probably lacked enough statistical power to detect the magnitude of change that might reasonably be expected. Nonetheless, it was encouraging to see a small but significant and worthwhile improvement in running efficiency from a relatively modest plyometric program. Spurrs and colleagues employed a slightly more demanding 6 week plyometric program in more experienced athletes. In the first three weeks, there were two plyometric session per week and then three sessions per week for the remaining three weeks. The majority of the exercises were hops (single or double-leg), all performed at maximal effort. Depth jumps were introduced in the fourth week. The number of foot contacts was 60 per session in the first week and increased gradually up to 180 per session by the final week. The gains were substantial. Running efficiency increased by 6.5% at 5 min/Km and by 4% at 3.75 min/Km. CMJ height increased significantly from 38cm to 43 cm and musculo-tendonous stiffness increased significantly by about 10% in each leg. 3Km time trial performance improved significantly by 2.7 % from 10:17 min to 10:10. There were no changes in VO2max or lactate threshold. A control group who continued with training as usual showed no significant changes in any measures. Overall, the prospect for gain in efficiency and in race pace from a 6 week plyometric program looked promising. However in light of my age and aching legs, it was clear that I should be cautious. I decided that in contrast to the approach employed by Turner, who placed emphasis on the muscles acting around the ankle (especially gastrocnemius and soleus), I would allow more flexion of hips and knees, since the large muscles (quads, hams and glutes) acting at these joints play a key role in running. I therefore anticipated that I would need to employ somewhat greater jump heights. A cautious introductory session with some hopping over 30cm high hurdles and drop jumps from 16 cm did not exacerbate the aches. In fact, at that time, running was somewhat more painful than the plyometrics, so I decided that I would proceed with the plyometrics while cutting back the amount of running to around 10 Km per week. I allowed three days recovery after each plyometric session, giving a total of three sessions every two weeks. I interleaved a mildly demanding weight lifting session between plyometric sessions. To prevent complete loss of aerobic fitness, I replaced the some of the running with sessions on the elliptical cross trainer. In the first plyometric session, after a gentle warm up that included body-weight squats, hip swings, calf-raises and line-jumps I did 5 sets of 2 double-leg hops over 30cm hurdles and 5 sets of 5 drop jumps from 16 cm, rebounding to 16cm (a total of 35 foot contacts in the session). This modest session left me with barely perceptible DOMS the next day. In subsequent sessions I increased the numbers of hurdle hops; the depth of the drop jumps; and added single-leg hurdle hops. By the end of the six weeks, each session included 5 sets of 7 double-leg hurdle hops (over 30cm hurdles); 5 sets of 5 single-leg hurdle hops on each leg (over 15 cm hurdles); and 5 sets of 5 drop jumps (from 30 cm rebounding to 30 cm (total of 110 foot contacts in the session). Although exact comparison with Turner’s program is not possible, I estimate that the early sessions in my program were less demanding than Turner’s, but the later sessions were roughly equivalent. However, whereas Turner’s athletes performed 18 sessions, I performed only 10 sessions over the six week period. My CMJ height increased from 30 to 33 cm. My other outcome measurement was horizontal distance covered in 5 consecutive double-leg hops. This increased from 8.63 m to 9.08 m.
Unfortunately, there seemed little point in assessing the impact on my running performance. Having done relatively little running in the 12 weeks since the half marathon, my aerobic fitness had deteriorated quite markedly, despite the elliptical sessions. It was clear that my fitness at the end of September had been built on a very narrow base, and by mid-December, it had melted away. However, one pleasing observation was that the persistent aches in my legs had almost entirely disappeared. Overall, the six weeks of quite modest plyometrics produced a definite increase in my jumping ability – comparable as far as can reasonably be estimated, with the gains exhibited in the study by Turner, though somewhat less than achieved in the more demanding program employed by Spurrs. Although I have no direct evidence of improved running efficiency or pace, the findings of both Turner and of Spurrs suggest that the improvement in jumping ability would probably have been enough to produce a worthwhile improvement in running efficiency, had I not lost aerobic fitness due to a drastic reduction in my volume of running. At present I find myself in an ambiguous position. I am somewhat dismayed by the severe and persistent aching in my legs that had developed in the summer during my preparation for the half marathon. If I am to succeed in my plan to run a full marathon next year, I will have to build up the volume of running more gradually than had been feasible this year. I will probably also include a higher proportion of elliptical cross-training. However, it is pleasing to have demonstrated that I can achieve gains in jumping performance from a relatively modest program of plyometrics. The gains appear comparable to those achieved by the young adults in the study by Turner, and perhaps even comparable to those achieved in the study by Spurrs, after allowing for the differences in volume and intensity of the plyometrics. Furthermore, it will be interesting to see whether or not this moderate amount of plyometrics makes me more resistant to aching legs, in the long term. Popular enthusiasm for the Paleo diet, including a relatively high proportion of fat and protein presumed characteristic of the diet of our hunter/gatherer ancestors, has re-ignited the long standing debate about the nutritional merits of fat and carbohydrates, especially for athletes. In recent posts I have compared the effects of a high-fat diet with those of a high-carbohydrate diet on metabolic processes that have the potential to effect endurance performance, health and life expectancy. We have examined the evidence of these different diets on the development of preferential use of fat rather than carbohydrates for fuel during exercise; on risk of sustained elevation of the stress hormone, cortisol; on insulin resistance and inflammation; and on weight control. The evidence shows that a high fat diet does promote the use of fats as fuel during exercise, potentially beneficial in warding off disabling glycogen depletion during prolonged exercise. However both types of diet are associated with risks of sustained elevation of cortisol, insulin resistance and chronic inflammation. Particular components of each type of diet, specifically high glycaemic index (GI) carbohydrates which produce a rapid rise in insulin after ingestion, and omega-6 fatty acids, which are pro-inflammatory, are associated with high risk. With regard to weight control, the evidence indicates that low fat and low carbohydrate diets are equally effective. This post examines the evidence for effects on the ultimate outcomes: race performance, health and longevity. When it comes to evidence regarding the effect of nutrition on performance, there are conflicting findings. In a meta-analysis of 20 studies comparing the effects of high fat with high carbohydrate diet on endurance exercise performance, Erlenbusch and colleagues found that averaged across all studies, subjects consuming a high-carbohydrate diet exercised significantly longer until exhaustion, but there were substantial differences between the findings of different studies, probably reflecting differences in the subjects studied and the design of the study. The benefit of the high carbohydrate diet was relatively large in studies of untrained subjects, but there was very little difference between the two types of diet in studies of trained athletes. In light of the fact that endurance training itself increases capacity for utilization of fats as fuel, it is plausible that in hitherto untrained subjects, a relatively brief period of high fat consumption is inadequate to produce a substantial capacity for fat utilization, so maximizing efficiency of glucose utilisation might be of greater value in such subjects. There are some noteworthy studies that have reported greater benefit for a high fat diet in trained athletes. An early study from Tim Noakes lab in Capetown compared the effects of 2 weeks of high fat (70%) low carbohydrate (7%) diet with a high carbohydrate (74%), low fat (12%) diet in trained cyclists. The high fat diet led to higher fat utilization and improved performance at moderate exercise intensity, without deterioration of performance at high intensity. The importance of starting an endurance event with well stocked glycogen stores suggests that greater benefit might be obtained for a periodized nutritional strategy in which high fat diet is followed by a brief period of carbohydrate loading. A subsequent study from the Capetown lab using the nutritional periodization strategy found that high-fat consumption for 10 days prior to carbohydrate loading was associated with an increased utilization of fat, a decreased reliance on muscle glycogen, and improved time trial performance in a 20 Km time-trial following 150 minutes of medium intensity cycling. Other studies of trained athletes reported equivocal results. Carey and colleagues tested the effect of fat adaptation using a nutritional periodization strategy, on performance during a one hour time trial following 4 hours of aerobic cycling. As expected the fat adaptation resulted in increased fat utilization. Power output was 11% higher during the time trial and distance covered was 4% greater, but this effect was not statistically significant. Nonetheless, in 5 of the 7 cyclists, the improvement in performance after fat adaptation was substantial, raising the possibility that the number of subjects was too small to provide adequate statistical power to test for a performance benefit. Yet other studies indicated no benefit and perhaps even harm from the fat adaptation strategy. A further study from the Capetown lab by Haverman and colleagues compared 100km cycling time trial performance and also 1 Km sprint performance following 6 days of high fat consumption and 1 day of carbohydrate loading with performance following 6 days of high carbohydrate consumption and 1 day of carbohydrate loading. The anticipated enhancement of fat utilization was observed, but there was no significant difference between diets in 100-km time-trial performance, while 1-km sprint power output was significantly worse after the high fat diet. The investigators concluded that despite increasing fat utilization, the strategy of high fat diet followed by carbohydrate loading compromised high intensity sprint performance. This raises the possibility that the increased fat utilization might reflect impaired ability to use carbohydrates rather than an enhanced ability to utilize fats. Thus, the tide of evidence has turned against the hope that fat adaptation produced by a period of one or two weeks of high fat consumption might be a worthwhile strategy for improving endurance performance. In contrast, this strategy might actually impair high intensity performance – an issue that is potentially of some importance even in events lasting several hours in which surges or hills might play a part in race outcome. The evidence does not rule out the possibility that some individuals might enjoy an improvement in endurance performance, but at this stage, the evidence does not justify a general recommendation of this strategy. Perhaps improvement in performance from rather drastic dietary adjustments over a period of a few weeks is not the issue of greatest importance to the endurance athlete, for whom training is an undertaking extending over many months or years. Rather, the question of greater importance is the effect of long term nutrition on long term health. Although no studies have examined the long term effects of long term nutrition in endurance athletes, recent evidence has provided increasing clarity regarding the optimum diet for long term health in the general population. We will focus on evidence related to heart health because heart disease is the greatest cause of mortality in the general population and in addition there is some evidence that extensive endurance training and racing might in fact increase the risk of cardiovascular disease in athletes. Furthermore, most evidence suggests that a healthy diet for the heart minimises risk of cancer, though there are instances where foods that appear healthy for the heart have been linked to increased risk of cancer. Although depression is associated with only a modest risk of premature death, it is the illness causing the greatest degree of disability world-wide (according to the World Health Organization). Furthermore, mental state is of substantial importance in athletic performance. Therefore, I will also briefly address the evidence regarding the association between diet and depression. In a recent comprehensive review of nutritional recommendations for cardiovascular disease prevention Eilat-Adar and colleagues found that both low fat and low carbohydrate diets are a healthy alternative to the typical Western diet. They note that low carbohydrate diets are associated with lower levels of potentially harmful tryglycerides and with higher levels of beneficial cholesterol in high density lipoprotein (HDL). Low-carbohydrate diets, which include 30%–40% of calories from carbohydrates and are low in saturated fat but high in mono-unsaturated fat, were found to be safe in healthy and overweight individuals at follow-up for up to 4 years. We will return to the controversial issue of saturated fat later. Eliat-Adar also found good evidence that Mediterranean diets, which include high consumption of fruit, vegetables and legumes, together with moderatley large amounts of fish but less red meat, may improve quality and life expectancy in healthy people, as well as in patients with diabetes, and heart disease. Mediterranean diets are preferable to a low-fat diet in reducing triglyceride levels, increasing HDL cholesterol, and improving insulin sensitivity. A meta-analysis of trials by the Cochrane Collaboration – an organization which does extremely rigorous and conservative reviews of medical treatments – also concluded that evidence suggests favourable effects of the Mediterranean diet on cardiovascular risk factors, though with their usual caution, they stated that more trials are needed. One trial that warrants special mention is the Spanish Prevención con Dieta Mediterránea (PREDIMED) trial, in which 7,216 men and women aged 55 to 80 years were randomized to 1 of 3 interventions: Mediterranean diets supplemented with nuts or olive oil and control diet. During a follow-up period of near to five years, nut consumption was associated with a significantly reduced risk of all-cause mortality. Subjects consuming more than 3 servings/week of nuts had a 39% lower mortality risk. A similar protective effect against cardiovascular and cancer mortality was observed. With regard to the issue of saturated versus unsaturated fats, a recent re-analysis of the large and well conducted West Sydney Heart study found that replacing dietary saturated fat with omega- 6 linoleic acid, for subjects with known cardiovascular disease, actually led higher all-cause death rate, and higher death rate from coronary heart disease and cardiovascular disease. The authors also performed a new meta-analysis of previous studies and found that the pooled data also provided a strong trend towards higher death rate when saturated fat was replaced by omega-6 linoleic acid. This finding is contrary to the prominent advice to substitute polyunsaturated fats for saturated fats in worldwide dietary guidelines for reducing risk of coronary heart disease. The most plausible explanation is that the increased death rate is due to the pro-inflammatory effects of omega-6 fatty acids. The frequent reports in both popular press and the medical literature linking various foodstuffs to cancers of various types makes this topic a mine-field. In part this situation reflects the heterogeneity of cancer and the multiplicity of different factors that might contribute to the cause in different cases. Nonetheless, in general, the evidence indicates that diets that are healthy with regard to weight control and cardiovascular outcome tend to be associated with lower risk of cancer. For example, a recent large review found that adherence to the Mediterranean diet was associated with lower risk of certain cancers, especially cancers of the digestive tract, consistent with the finding from the PREDIMED study mentioned above. However, in light of the fact that a key difference between typical Western diets and the Mediterranean diet is the larger relative amount of omega-3 fats in the Mediterranean diet, it is noteworthy that some studies have reported that omega-3 fats are associated with increased rate of prostate cancer, while others have reported a decreased rate. This should encourage caution against simplistic conclusions that a food item is invariably healthy in all amounts and all circumstances. Many studies using relatively low quality methodology to assess diet and/or mental state have reported an association between adherence to a ‘healthy’ diet and decreased risk of depression. More recently, several studies have addressed this issue using more rigorous methodology. A meta-analysis by Psaltopolou and colleagues of studies examining the association between Mediterranean diet and risk of various neurological and mental disorders found that the Mediterranean diet was associated with a decrease in risk of depression of approximately 30%. This reduction was very similar in magnitude to the reduction of risk of stroke and for cognitive impairment. However, association cannot establish cause, and it is possible that other life-style factors associated with adherence to a healthy diet account for the better physical and mental health. The most conclusive evidence comes for randomized controlled trials in which individuals are randomly allocated to different diets. In the PREDIMED trial, the group who were allocated to the Mediterranean diet augmented with extra nuts experienced a 20% lower rate of depression over a period of 3 years, compared with those on a low fat diet. This was not a statistically significant reduction. However, in those who had type 2 diabetes, the Mediterranean diet with extra nuts produced a 40% reduction in occurrence of depression which was significant. Thus the balance of evidence does suggest that a Mediterranean diet augmented by nuts produces a reduction which is significant at least in those who already show other evidence of adverse metabolic effects. There is overwhelming evidence that diet plays a large role in health and longevity, and after many years of confusing debate, there is emerging clarity about the type of diet that is healthiest. This is neither a high fat/low carbohydrate Paleo diet nor a low fat/high carbohydrate diet. Rather, a substantial body of evidence suggests a Mediterranean diet is preferable, especially when augmented with extra nuts. There is some variability between studies in what is taken to be the Mediterranean diet, but the consistent features include high consumption of fruits, vegetables and legumes (beans, nuts, peas, lentils); low consumption of red meat and meat products but substantial consumption of fish; near equal proportions of omega-3 and omega-6 fats; moderate consumption of milk and dairy products; and low to moderate red wine consumption. The status of grains and cereals is ambiguous. The Mediterranean diet adopted in PREDIMED included a high consumption of grain and cereals. In general, whole grains and cereals appear healthy though gluten sensitivity is an issue for at least some individuals. While the evidence for the Mediterranean diet is largely based on studies of the general population with emphasis on heart health, rather than being focused on athletes, the disconcerting evidence that male athletes who have run numerous marathons over a period of many years are at risk of atherosclerosis (as discussed in detail in my post of 30th May, 2012) suggests that a ‘heart-healthy’ diet should be a high priority for endurance athletes. When it comes to endurance performance, there is no clear evidence in favour of any particular diet. However the consistent evidence that a high fat/low carbohydrate diet promotes preferential utilization of fats during exercise appeared promising at first. It is disappointing that this apparently beneficial adaptation is not reflected in enhanced performance, even in ultra-endurance events. On contrast, there is actually evidence that it can harm high intensity performance, such as 1 Km cycling time trial performance. However, the fact that at least some individuals do appear to show an endurance performance benefit from a high fat diet (followed by brief duration carbohydrate loading) as observed in the study by Carey and colleagues, makes me reluctant to dismiss the potential value of at least moderately high fat consumption. One crucial issue is to identify why the clear evidence of improved fat utilization does not generally lead to enhanced performance. It appears that the fat adaptation strategy, at least in the form of a rapid increase in proportion of fat to a quite high level over a periods of a few weeks, is in some way harming the utilization of carbohydrates as much as it might be improving the utilization of fats. In my opinion, one candidate mechanism by which high fat consumption might harm carbohydrate metabolism in muscle is the elevation of cortisol associated with the fat adaptation strategy used in the studies. One immediate effect of high cortisol is the decrease in accessibility of the glut4 transporter molecules that transport glucose into muscle. Furthermore, sustained elevation of cortisol can produce a decrease in sensitivity of glucocorticoid receptors that mediate the various effects of cortisol, including its anti-inflammatory effects, thereby possibly leading somewhat paradoxically to chronic inflammation. This is speculation on the basis of what is known about mechanisms rather than direct evidence of beneficial or harmful effects in practice. Nonetheless, it appears to me plausible that a gradual introduction of a higher proportion of fats, at least up to the modest levels in the Mediterranean diet, over a more sustained period might produce promote preferential utilization of fat during exercise in a manner that translates into improved endurance performance. In light of the evidence that glycogen depletion during training can enhance training effects, I consider that during normal training, consumption of carbohydrates is potentially counter-productive, in most instances. Exceptions might include high intensity sessions; very prolonged sessions; or for the purpose of testing the planned strategy for race day in the final few long runs of marathon/ultra-marathon preparation. However, the need to start an endurance event with glycogen stores well stocked suggests that at least a brief period of carbohydrate loading, and ingestion of carbohydrates during long events, is highly desirable. In summary, I consider that the emerging evidence provides strong support for the proposal that the optimum nutrition for most endurance athletes is a Mediterranean diet, but with carbohydrate loading immediately prior to long races. Paleo v High Carbohydrate diet: the evidence for metabolic differences affecting health and endurance performance. The recent surge of interest in the Paleo diet, based on the speculation that evolution has equipped humankind to thrive on a diet relatively rich in fat and low in carbohydrate, has added new spice to the long-standing debate over the optimum proportion of fat and carbohydrate in our diets. This debate is of substantial importance for anyone seeking to live a long and healthy life, and is of particular importance for endurance athletes who subject their bodies to the rigours of extensive training and require those long-suffering bodies to function with peak efficiency on race day. There are five related mechanisms by which diet is likely to affect health, longevity, response to training and race performance. These five mechanisms are: the capacity to utilise fat in preference to carbohydrate; minimization of sustained elevation of cortisol; avoidance of chronic inflammation; prevention of insulin resistance; and control of body weight. In the post, I plan to examine the evidence regarding the influence of the proportions of fat and carbohydrate in the diet on these five related mechanisms. In my final post in this series, I will examine the evidence for effects on the ultimate outcomes: race performance, health and longevity. I will start with a brief review of an issue covered in my most recent post: the metabolic challenges that the runner faces if glycogen becomes depleted in the final stages of a marathon. The body’s paramount goal in these circumstances is ensuring adequate glucose to fuel the activity of the brain. Secretion of the stress hormone, cortisol, increases dramatically, with three immediate consequences: cortisol promotes gluconeogenesis in the liver thereby replenishing glucose; it inhibits the function of the glut4 transporters that transport glucose across the cell membrane into muscle cells and other peripheral tissues; and it promotes beta-oxidation of fatty acids which become the main energy source for muscle. This response averts disaster for the brain, but it is not ideal. Not only does excessive elevation of cortisol have potential adverse long term effects, but there are immediate undesirable consequences. Reliance of fat as the main fuel for muscle have a dampening effect on power output because fat metabolism requires oxygen making it difficult to exceed the limit achievable aerobically, but in addition, as we saw from an examination of the central role that the Krebs cycle plays in both catabolic and anabolic processes, there are multiple other metabolic consequences. Reduced production of pyruvate from glucose in muscle makes it necessary to utilize glutamine to keep the level of the intermediate metabolites of the Krebs cycle topped up. Muscle is the main source of glutamine for other organs and body systems. Depletion of glutamine in muscle leads to a fall in blood levels of glutamine which has adverse effects in the gut, liver, kidney and immune system. In the gut, glutamine serves a diverse range of essential metabolic functions. In the liver, glutamine is a major source of the oxaloacetate required for gluconeogenesis, when low levels of glycogen limit the generation of oxaloacetate via pyruvate derived from glucose. In the kidney, glutamine is the source of ammonia needed for the excretion of acids. Glutamine also plays crucial catabolic and anabolic roles in the cells of the immune system, and a fall in glutamine will exacerbate the direct adverse effect of cortisol on the immune function. Although the body appears prepared to tolerate some loss of immune function during vigorous exercise, overall, it is undesirable to allow glutamine level to fall too far. Therefore, not only is it crucial to start an endurance event with well-stocked glycogen stores, but one of the key goals of endurance training is developing the capacity to utilise fats in preference to glucose at aerobic paces thereby avoiding a state of serious glycogen depletion in long races. Effect of nutrition on capacity to metabolise fats during exercise. Many studies, reviewed by Burke and Hawley, demonstrate that a high fat diet promotes the utilization of fats during exercise. However, on race day, the endurance athlete requires not only a well developed ability to utilise fats, thereby minimising the depletion of glycogen stores, but also needs to start the race with glycogen stores fully topped up. Fortunately, the evidence reviewed by Burke an Hawley indicates that switching from a high fat diet to a high carbohydrate diet in the period immediately before the race does not undermine the ability to utilise fats. As an illustration, Staudacher and colleagues demonstrated that a short term high fat diet (6 days; 69% fat) followed by a high carbohydrate diet in the day preceding exercise produced a 34% enhancement of ability to utilise fats during submaximal cycling in a group of highly trained endurance athletes, whereas 6 days of high carbohydrate intake (70% carbohydrate) followed by a further high carbohydrate day, resulted in a 30% reduction in fat utilization. This has encouraged the hope that a “fat adaptation” strategy in which a high-fat, low-carbohydrate diet is consumed for up to 2 weeks during normal training, followed by high-carbohydrate diet during a brief taper in the few days before a key race, might improve performance. However despite the consistent evidence that such nutritional periodization can achieve the desired enhancement of fat utilization, there is less clear evidence of enhancement of race performance. This might simply be that may other factors influence performance, so large, well-controlled studies are required to allow any benefit for this nutritional strategy to emerge clearly from the inconsistencies due to other sources of variance. Alternatively, it might be that this nutritional strategy has hidden adverse effects. For example, it is plausible that the nutritional strategy might upset hormonal balance is an adverse manner. I will return to the issue of effects on performance in my next post, but first we need to consider the possible effects of nutrition on hormones such as cortisol and insulin. The balance of evidence indicates that a very low intake of carbohydrate and high fat consumption, for either a few days or for longer periods, leads to sustained elevation of cortisol. For example, Langfort and colleagues compared the effects of 3 days of a high fat and protein diet (50% fat, 45% protein and 5% carbohydrates) with three days of a mixed diet. They observed no difference in maximal aerobic capacity, but did observe a significant increase in both adrenaline and cortisol before and after exercise. Furthermore, several studies have shown sustained elevation of cortisol after longer periods of high fat diet. For example, in a comparison of three different diets, each administered for 4 weeks to overweight young adults, Ebbeling and colleagues found that twenty-four hour urinary cortisol excretion was highest with the low-carbohydrate, high fat diet (10% from carbohydrate, 60% from fat, and 30% from protein.) Similar effects are seen with more moderate amounts of fat. For example, in a study of runners, Venkatraman and colleagues observed greater pre-test cortisol after 4 weeks at 40% fat compared with 15% fat, but in other respects, the outcome tended to be more favourable, including greater time to exhaustion in the 40% fat group. The type of fat might matter: in a study of Spanish women, García-Prieto and colleagues found that high saturated fat intake was associated with an unfavourable loss of the normal daily variability in cortisol levels while women who dietary pattern was closer to the Mediterranean diet, with high consumption of monounsaturated fatty acids, showed healthy regulation of cortisol levels. However, it perhaps important to emphasize at this point that when it comes to other long term health outcomes (which we will examine in the next post) there is relatively little evidence that saturated fats are especially harmful. There is little basis for the long-standing demonization of saturated fats in comparison with unsaturated fats. The recent pressure by the UK government on the food industry to reduce saturated fat content of foods is scarcely justified. Nonetheless, the association between a high proportion of dietary fat and sustained elevation of cortisol is a potential concern. Epidemiological studies demonstrate that sustained high cortisol levels may promote adiposity, insulin resistance, and cardiovascular disease. For example, in a 6-year prospective, population-based study of older adults, individuals in the highest third of 24-hour cortisol excretion had a 5-fold increased risk of cardiovascular mortality, compared with the lowest third. One of the important mechanisms in adverse long term cardiovascular outcome is insulin resistance, the cardinal feature of type 2 diabetes. The claims regarding the relative harmfulness of fats and carbohydrates in regard to insulin resistance remain a source of controversy. Consistent with the evidence that high blood and tissue levels of fatty acids are associated with insulin resistance a substantial body of historical evidence indicates that high fat diet impairs glucose tolerance. On the other hand, ingestion of carbohydrate leads to increased levels of blood glucose which triggers insulin release, which in turn can result in insulin resistance. It is likely that the answer is not to be found simply in the proportion of energy derived from carbohydrate or fat, but rather in the type of carbohydrate or fat. In the case of carbohydrates, it is likely that high glycaemic index (GI) foods promote insulin resistance. Brand-Miller and colleagues demonstrated that in lean young adults, a meal with a high glycemic load (the mathematical product of the amount of carbohydrate by the glycemic index of the carbohydrate-containing foods) result in higher insulin concentration, than a meal with similar total calories but low glycemic load. At least in individuals at genetic risk, high insulin secretion promotes insulin resistance. Consistent with this evidence suggesting that a diet based on low glycaemic load might reduce insulin resistance in those at risk, Barnard and colleagues demonstrated that a low fat vegan diet with a high proportion of low GI carbohydrates improved the control of blood glucose in individuals with type 2 diabetes more effectively than a low carbohydrate diet. A large body of evidence, reviewed by Grimble and colleagues, reveals an association between insulin resistance and chronic inflammation. Grimble concludes that the evidence regarding the direction of the causal relationship favours chronic inflammation as a trigger for chronic insulin insensitivity. Endurance athletes are at particular risk of chronic inflammation, in part on account of the repeated trauma to muscle and other connective tissues associated with training, making the effect of nutrition on inflammation a crucial issue. The issue is complex. On the one hand, as discussed in my recent post on inflammation, a high carbohydrate load can promote inflammation due to the release of the pro-inflammatory fatty acid arachidonic acid in association with insulin secretion from the pancreas. Furthermore, some carbohydrates, especially cereals containing gluten, can impair the lining of the gut, leading to chronic inflammation. However, a high fat diet also carries risk. Omega-6 fatty acids are pro-inflammatory, making it important to have a good balance of omega-3 and omega-6 fats in the diet, yet the typical Western diet is much richer in omega-6 fats. Thus, both a high carbohydrate diet and a high fat carry risk of inflammation, with evidence suggesting that identifiable components of these diets account for much of the risk. High GI carbohydrates and a -6 to omega-3 fats appear to generate the greatest risk. The traditional Mediterranean diet, containing a moderately high level of fat with near equal proportions of omega-3 ad omega-6 fats; and vegetables with a relatively low glycaemic index, appears to offer a near optimum combination. In a comprehensive review association of dietary patterns with inflammation and the metabolic syndrome (whose key feature is insulin resistance), Ahluwalia and colleagues concluded that healthy diets such as the Mediterranean diet can reduce inflammation and the metabolic syndrome. While control of body weight is one of the major preoccupations of dieting non-athletes, it is not usually the main preoccupation among endurance athletes simply because endurance training itself promotes weight loss. Nonetheless, even a modest excess of weight has serious implications for endurance race performance, because the energy required to accelerate the body to compensate for the inevitable braking during every stride, and to elevate the centre of mass in order to become airborne, is proportional to body mass. Therefore, the weight of any body tissue that is not performing a useful purpose is a handicap. However, the issue of what tissues perform a useful purpose for the endurance athlete is not entirely straightforward. Muscle that does not contribute to propulsion might be a handicap, while at least some fat is required to sustain balanced hormonal function. The ideal weight for endurance athletes is likely to vary between individuals, but observation of elite athletes suggests it is likely to correspond to a body mass index range between 20 and 23. Alternatively, since excess fat is likely to be a greater handicap than excess muscle, a body fat percentage in the range 5-11 percent for males and a somewhat higher proportion for females, might be a more relevant guide. While an excess of the ratio of total calories consumed to total calories expended is an important factor in determining the likelihood of weight gain, there has been much debate about the relative merits of low fat or low carbohydrate diets. A recent meta-analysis of 23 trials including almost three thousand participants concluded that both types of diet improved weight and metabolic risk factors, with no significant differences between the two in the reductions in body weight or waist circumference. Nonetheless there were slight but significant differences in some of the metabolic risk factors, with low carbohydrate diets producing a potently healthier increase in high density lipoprotein cholesterol and reduction in triglycerides, but a lesser reduction in potentially harmful low density lipoprotein cholesterol. The authors concluded that low-carbohydrate diets are at least as effective as low-fat diets at reducing weight and improving metabolic risk factors. Nutrition does indeed have an appreciable impact on the five metabolic mechanisms that are likely to influence both endurance performance and long term health. There is unequivocal evidence that a high fat diet produces an increase in the utilization of fats in preference to carbohydrate, which is potentially beneficial for endurance performance. However, there is also evidence that consumption of a high fat diet over a period ranging from a few days to 4 weeks, results in a sustained increase on cortisol, which is potentially harmful in the medium and long term. Nutrition also plays an important role in insulin resistance and inflammation. For these two issues, the type of fat or carbohydrate appears to be especially important. High GI carbohydrates and high total glycaemic load promote inflammation and insulin resistance. However high levels of fat in blood and in body tissues are associated with insulin resistance, while omega-6 fats are pro-inflammatory. With regard to weight control, either low fat or low carbohydrate diets can be effective. Overall, these observations do not provide any simple answer to the question of the optimum proportion of fat to carbohydrate, but do suggest that both fats and carbohydrates can carry risks. It is noteworthy that much of the evidence demonstrating adverse effects is based on studies in which there was an abrupt change to a high proportion of either fat or carbohydrate. In the next post, we will examine the evidence regarding the influence of proportion of fats and carbohydrates on endurance performance and on long term health, before finally drawing practical conclusions based on a synthesis of the evidence. In this post and the next, my aim is to explore the contentious issue of the optimum of balance of fat and carbohydrate in an endurance runner’s diet, focussing on evidence for the effects on training adaptation, on running performance, and on overall health. In my previous two posts I have addressed specific aspects of nutrition: the advantages and disadvantage of training in a fasted state; and nutritional strategies to minimise risk of chronic inflammation. Both of those topics are relevant to the current discussion, so I will start by summarising the conclusions from those posts. With regard to inflammation, while acute inflammation promotes tissue repair after training, chronic inflammation is not only associated with the overtraining syndrome but also carries a serious risk of long term cardiovascular disease. The evidence indicates that two worthwhile nutritional strategies are minimization of high Glucose Index carbohydrates (which promote a spike of insulin which can be associated with release of arachidonic acid, which is pro-inflammatory) and the consumption of approximately equal proportions of non-inflammatory omega 3 and pro-inflammatory omega 6 fats. Thus, the need to avoid chronic inflammation indicates which carbohydrates and which fats are healthy, but does not address the question of the optimum proportion of fat to carbohydrate. In recent decades, many endurance athletes have favoured a high carbohydrate diet but in recent time, the high fat/ high protein Paleo diet has attracted attention, based on the speculation that our primitive ancestors adapted via evolution to such a diet. Why is the debate so controversial? The advocates of a high intake of carbohydrates, and advocates of low carbohydrate/high fat diet such as the Paleo diet can each assemble evidence, from both anecdotes and from systematic scientific study to support their cases. Resolution of the debate is elusive because the evidence appears contradictory. The reason why the evidence is confusing becomes clear when you examine the complexity of the network of metabolic processes, including the catabolic processes by which fuel stores and body tissue are broken down to produce energy, and the anabolic processes by which tissues are repaired, strengthened and develop increased metabolic capacity. There are multiple pathways by which a particular metabolic goal can be achieved. This allows flexibility, but the choice of a particular fuel source, or a particular source of building material for anabolic processes has diverse knock-on effects. In many instances, the stimulation or inhibition of a particular metabolic pathway depends on the release of a particular hormone, and the relevant hormones can have diverse effects extending beyond the immediate metabolic goal. Genes, past training experiences and diet all influence the outcome. Therefore it is not surprising that evidence from studies of the effects of diet on small groups of individuals give differing results depending on the features of those individuals, Conversely, attempting to apply conclusions from epidemiological studies of large populations to an individual might be misleading. However, the picture is not hopeless. I think that sound, though nonetheless tentative, conclusions can be drawn from the existing evidence. Some understanding of the inter-locking networks of catabolic and anabolic pathways helps in achieving a sensible application of these conclusion to one’s own situation. Successful training demands a balance between catabolism: the break-down of carbohydrates, fats or proteins to yield the energy required to fuel muscle contraction, and also the process of autophagy, required to remove debris from cells; and anabolism: the building of body tissues to repair damage suffered during training, build new tissue, and develop increased metabolic capacity. Although the details of the biochemical pathways are complex, the broad outline is fairly easy to grasp, provided one avoids being bamboozled by the names of the molecules. Figure 1. The Krebs cycle. All three main types of fuel, carbohydrates, fats and proteins feed into the cycle. The major output is hydrogen (attached to the coenzyme NAD), which provides electrons to the electron transport chain, thereby generating ATP. In addition, several important anabolic pathways begin as branches from the cycle. Figure 1 illustrates the cardinal role in both catabolism and anabolism played by the cyclic pathway known as the Krebs cycle, named after Hans Krebs, the biochemist who delineated it. For our present purpose, there are two important things to observe in this map of the metabolic pathways. First, the catabolic pathways by which the three major types of fuel (carbohydrate, fats and proteins) are burned to generate energy, converge onto the Krebs cycle. Training that produces an increase in the enzymes that carry out the biochemical transformations that make up the Krebs cycle will increase the capacity to utilise any one of the three types of fuel, but the question of which fuel is selected in particular circumstances depends on availability of the raw material and on the hormonal milieu. Secondly, some of the key anabolic pathways which produce amino acids, (the building blocks of proteins) and also many other substances essential for various bodily functions, begin as off-shoots of this cyclic pathway. The enzymes that carry out the reactions of the Krebs cycle are located in mitochondria, the sub-cellular powerhouses in which the energy rich molecule ATP is produced as a result of oxidation of fuel. The cycle starts with the combination of a molecule containing 4 carbon atoms, oxaloacetate, with a fuel fragment containing 2 carbon atoms, known as an acetyl group, which has been generated by the first steps in the catabolism of carbohydrate, fat or protein. The combination of the 4-carbon oxaloacetate with the 2-carbon acetyl group produces citrate, which contains 6 carbon atoms. The citrate then enters a series of eight chemical transformations catalysed by enzymes. In two of these transformations a carbon atom is removed and combined with oxygen to produce carbon dioxide. By the time the original 6-carbon molecule completes the cycle it has been converted back to the 4-carbon oxaloacetate, and is ready to repeat the cycle. There are several important outputs from the cycle. Most important for the role of the Krebs cycle in the generation of energy is the transfer of hydrogen atoms (carried by the coenzyme, NAD) to a complex of enzymes known as cytochromes, which are the key components of a system known as the electron transport chain. The hydrogen atoms feed electrons into this chain thereby providing the energy to create the high energy molecule ATP from its precursor ADP. ATP fuels virtually all of the energy-demanding activities of the cell, including muscle contraction. Furthermore various other metabolic pathways branch off from intermediate stages in the Krebs cycle. Several of these pathways result in the synthesis of amino acids. These are required not only for the building of proteins but also serve many other roles. One of the most important is glutamine, highlighted in blue in figure 1. Glutamine is the most abundant amino acid in the body. It is mainly produced in muscle, but serves as a key fuel for the cells lining the gut. It also plays a key role in the transmission of long-range communication within the brain. However glutamine can also be synthesized in the brain, so the brain is not critically dependent on muscle for glutamine, but it is of interest that glutamine is the one amino acids that can cross the blood-brain barrier. Glutamine is also required to fuel cells of the immune system. During intense exercise, the spin-off pathway that produces glutamine cannot cope with demand and glutamine levels fall. It is possible that the decreased availability of glutamine is one factor leading to increased susceptibility of marathon runners to minor respiratory infections. However, there is no convincing evidence that glutamine supplements reduce the prevalence of colds in marathoners. Nonetheless, one important consequence of the spin-off of glutamine is that the Krebs cycle gets depleted of some of its intermediates, and oxaloacetate has to be topped-up if the cycle is to be sustained. This can be achieved by the direct conversion of pyruvate (high-lighted in red in figure 1) to oxaloacetate. Thus, even when fat is the main source of fuel entering the Krebs cycle, a contribution from pyruvate is required to top-up the cycle. Pyruvate also serves as the beginning point for the synthesis of several amino acids. Pyruvate is produced from glucose via glycolysis. The multiple key roles of pyruvate illustrate the essential role for glucose, even when the muscle cell is deriving most of its energy from fat. When oxygen supply is inadequate, the Krebs cycle slows down and pyruvate is converted to lactate. During the generation of pyruvate from glucose via glycolysis, each molecule glucose yields only the 2 molecules of ATP (plus two molecules of NADH which can transfer electrons into the electron transport chain, each generating an additional 2 molecules of ATP), in contrast of the total of 36 molecules of ATP produced by the full sequence of glycolysis, the Krebs cycle and electron transport along the electron transport chain. Although not all details are shown in figure 1, the intermediate metabolites of the Krebs cycle can also act as the starting point in the synthesis of many other substances that play a key role in the biochemical processes that occur in cells, and can also act as the precursors for the synthesis of glucose and fats. 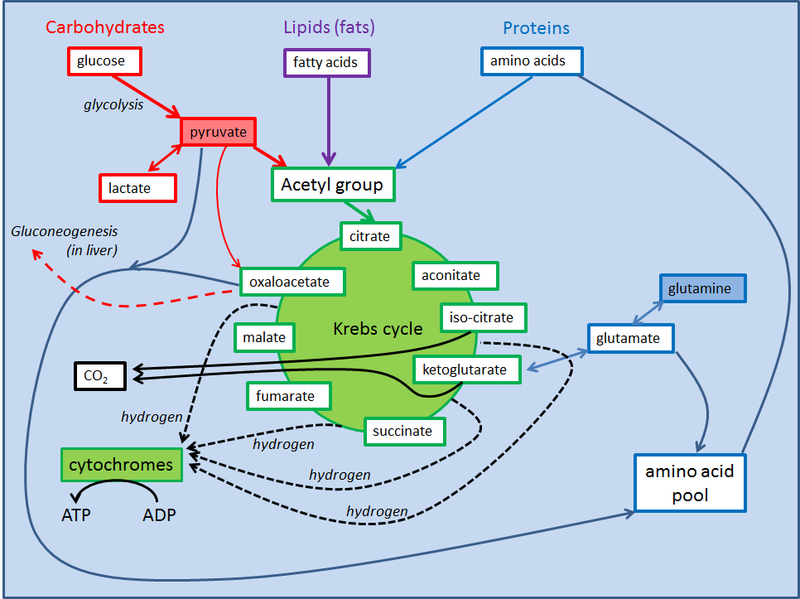 In summary, the Krebs cycle lies at the centre of a complex network of catabolic and anabolic processes. As mentioned above, the network of pathways offers the flexibility provided by alternative ways of meeting its metabolic needs. Energy can be derived from various different sources; and there are alternative ways of synthesising the molecules required to replenish fuel stores after training; to repair the body; to increase strength by augmenting muscle and other connective tissues; and to increase metabolic capacity by synthesis of enzymes. As an illustration of the ways in which the body typically deploys these pathways to deal with particular circumstances, let us consider the situation facing an endurance runner when glycogen supplies begin to run out – the infamous ‘bonk’ that typically occurs in the final 10 Km of a marathon. Glycogen is the storage form of carbohydrate from which glucose is released. Even if we are mainly burning fat, muscle requires some glucose to feed into the glycolytic pathway to ensure a reasonable supply of pyruvate, necessary for keeping the Krebs cycle topped up to replace the keto-glutarate that is diverted to produce glutamine. By this stage of the race, glutamine is becoming depleted, yet is needed to keep the cells of the gut wall functioning well, and also to help the kidney to maintain acid-base balance. But even more importantly, the brain needs glucose for fuel because the brain has very few other options for providing energy. So the body’s highest priority is maintaining adequate glucose levels to supply the brain. When glycogen stores become seriously depleted, the tendency for blood glucose to fall stimulates cortisol release. This was illustrated in a study by Tabata and colleagues in which healthy young men exercised to exhaustion following a 14 hour fast. Both ACTH (which promotes cortisol release from adrenals) and cortisol itself, were increased. Cortisol stimulates the synthesis of glucose (from pyruvate and oxaloacetate) via the process known as gluconeogenesis (see figure 1) in the liver. At this stage of a marathon, the main source of the pyruvate is likely to be lactate generated in muscle and transported via the blood to the liver. Alternatively, glutamine might be converted to ketoglutarate and thence to oxaloacetate. Because the priority is supplying the brain, not the muscles, cortisol inhibits the transport of glucose into peripheral tissues, including muscle, by keeping the glucose transporter molecules away for the cell surface. The increased level of cortisol is likely to result in further reduction of liver glycogen, because cortisol facilitates the action of adrenaline in promoting breakdown of glycogen. It is noteworthy, that under other circumstances, cortisol can facilitate the action of insulin in synthesis of glycogen, but that is unlikely to apply in states of serious glycogen depletion since the body’s priority will be maintaining blood glucose. Because cortisol has acted to decrease the transport of glucose into muscle cells, the major input of fuel to the Krebs cycle in muscle must come from fats. There are two pathways by which fats can generate the acetyl groups that keep the Krebs cycle revolving and producing energy: beta oxidation that splits the two-carbon acetyl group from long fatty acid chains, and the production of ketones. Beta-oxidation is stimulated by cortisol. Furthermore, when liver glycogen levels are low, fats are converted to ketones in the liver, whence they are released into the blood stream. In both the brain and muscle, ketones can generate the acetyl groups required to maintain the energy supply. Thus the body has a substantial capacity to ensure that the brain is supplied with glucose, and in extremis, with ketones. However this is achieved at the price of the elevation of cortisol. As discussed previously, Skoluda and colleagues have demonstrated endurance athletes tend to have sustained high levels of cortisol. In the long term this can lead to many adverse effects, including immune suppression, and also, somewhat paradoxically, chronic inflammation, probably mediated by a decrease in sensitivity of glucocorticoid receptors that mediate the effects of cortisol. Thus one of the major needs of the endurance runner is enhancement of the capacity to utilise fats in preference to glucose before marked depletion of glycogen occurs. Both training itself and diet can help achieve this. In the next post, we will examine the evidence regarding the effects of diet not only on modulating the effects of training, but also on long term health. You are currently browsing the Canute's Efficient Running Site blog archives for December, 2013.